Do you like fish fingers and custard? Do you have an unusually low body temperature and two separate heart beats? 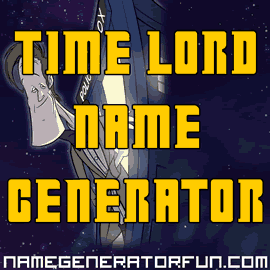 Then prepare for your voyage through the endless worlds and times of Doctor Who with the unofficial Time Lord name generator! Our Doctor Who inspired generator will not only give you a new identity as a renegade Time Lord, but you'll also get your full Gallifreyan name (and its shortened version), what you used to do before you escaped your home planet for a life of adventure, the current disguise of your stolen TARDIS, and a companion to travel with you! Time Lords are the elite of the planet Gallifrey in the constellation of Kasterbouros, and they are super-intelligent beings who can live for thousands of years (although not all Gallifreyans are Time Lords). They appear human, but have many physiological differences – Time Lords have two hearts, an internal temperature of only 15 degrees Centigrade, and a respiratory bypass system that protects them from suffocation and strangulation. They also have the power of regeneration, meaning they can completely transform their appearance and personality twelve times, although certain Time Lords have found ways of extending their lives and even acquiring new regeneration cycles. Much of Time Lord society is aloof and stagnant – power lies with the High Council, ruled by the Lord President and the principle colleges, where it only matters whether you are a member of the Prydonian, Arcalian or Patrexe chapters. Bureaucracy and order rule the day, while many secrets are hidden away in the computer system known as the Matrix, where the combined intelligences of generations of deceased Time Lords can create a whole virtual universe of dreams and nightmares. Gallifrey is a frustrating, dull place to live – so it's no wonder that you've finally had enough and are stealing a TARDIS so that you can escape and travel the universe! The Time Lords were first created in 1969 by writers Malcolm Hulke and Terrance Dicks, in 'The War Games', Patrick Troughton's final story as the Second Doctor. The Doctor's home planet was first named as Gallifrey in 1973 in the story 'The Time Warrior', written by Robert Holmes. Since then, the mythos of Gallifrey has expanded in a massive number of ways thanks to stories like The Deadly Assassin, 'The Invasion of Time', 'Arc of Infinity' and 'The Trial of a Time Lord', and we've tried to use as much detail from the classic shows and from various spin-off novels as possible in creating the Time Lord names. We wanted to ensure that our generator is as accurate and thematic as possible, especially when it comes to the names. It's first established in the 1977 story 'The Ribos Operation' (written by Robert Holmes) that Time Lord names can be amazingly long, thanks to the companion Romana's full name of Romanadvoratrelunder. Since then, various Doctor Who spin-off novels have built on this idea, especially the Marc Platt novel 'Lungbarrow', and we crafted the full Gallifreyan names so they could be as varied as possible but could still be properly abbreviated into a shorter name that would fit with the other Gallifreyan names we've seen in the series and in spin-off media (like Rodan, Nesbin, Zorac, Hildred, Hedin, Kelner, Spandrell and many more.) We've also added plenty of references to Gallifreyan locations like the Capitol, Arcadia, and the Archives, and have tried to make sure that each unique name comes with plenty of color, fun and entertainment that hopefully pays a warm tribute to the world of Doctor Who. If you like the brilliant background cartoon of Matt Smith, it's done by Demon Tomato Dave from Dumpy Little Robot, and is used with permission. If you like this generator, you might also like our Star Wars names. Disclaimer: This is a fan commentary page intended to encourage interest in Doctor Who. This page is not an official publication and is not in any way affiliated with or endorsed by Doctor Who, the BBC, or any of their licensees. Copyrights and trademarks for the TV series, films, books, articles, toys, and other promotional materials are held by their respective owners and reference to them is allowed under the fair use clause of copyright law. Our page is in no way intended to harm or undermine the market value of Doctor Who or the BBC, rather to encourage fans to engage with and seek out works set in the Doctor Who universe. Image Credit: Tardis and Eleven by Dave Bulmer.